Bristol researchers are at the heart of a £6m project developing the next generation of optical networks to support 5G wireless technology. The three-year METRO-HAUL project includes software defined networking (SDN) startup Zeetta Networks and the University of Bristol’s High Performance Networking group in the Department of Engineering alongside 19 other organisations around Europe. These include operators BT, Telecom Italia, and 02’s Spanish owner Telefonica, equipment makers Ericsson and Nokia, and German research group Fraunhofer Institute. The next generation 5G technology is currently being developed to provide up to 1Gbit/s of download speed, but that will need to be supported by higher performance optical networks. The aim of the project is to design and build smart, cost-effective, optical systems for urban areas that can support increased traffic coming from all kinds of 5G links, whether these are base stations, small cells or connections from the Internet of Things (IoT). By 2019 the project will build a 5G network with a range of services in a test-bed, and the software developed will be released as a public repository while the project will actively participate in the standardisation of 5G, promoting the tested solutions to the wider industry. This is just one of several 5G projects that include technology companies from the region. For example, Blu Wireless Technology is part of the XHaul project that is looking at other ways to provide the links that will be needed and recently hosted all the researchers involved to collaborate in Bristol. The money will be used for R&D and to boost the commercial team, increasing the staff from 20 to perhaps 30 says Rupert Baines, UltraSoC CEO, and looking at opening an office in Bristol. Atlante Tech leads a strong line up of new investors including Enso Ventures, Oxford Capital, and successful CEO and serial entrepreneur Guillaume d’Eyssautier (former CEO of picoCHip and ganeral manager of Cadence Design Systems), who join existing investors Octopus Ventures and South East Seed Fund (FSE Group). Successful development of the company’s debug tools and increased awareness of the technology’s potential benefits has meant a series of significant commercial engagements, with more in the pipeline. Amongst others, HiSilicon (Huawei), Imagination Technologies, Movidius (now Intel), and Microsemi all use UltraSoC technology in their designs, delivering proven hardware-embedded benefits to their customers. To ensure these benefits are accessible to customers in all sectors across the globe, UltraSoC partners with leading names in the semiconductor industry including ARM, Baysand, Cadence/Tensilica, CEVA, Codasip, Lauterbach, MIPS and Teledyne LeCroy.UltraSoC’s flagship product line is a suite of semiconductor IP that allows chip designers to integrate an intelligent analytics infrastructure into the core hardware of their devices. By monitoring and analysing the real-world behaviour of entire systems via UltraSoC’s intelligent analytics embedded in the silicon, engineers can take action to reduce system power consumption, increase performance, protect against malicious intrusions, and ensure product safety. Quantum technology developed in Bristol is being used in medical screening, drone-based gas-leak detection and cryptography. Three of the entrepreneurs on this year’s programme at the Quantum Technology Enterprise Centre (QTEC), the first, have been showing their plans. The course at the University of Bristol combines business training with technology development and is looking to recruit 11 more entrepreneurs for next year’s programme. Neciah Dorh of FluoretiQ is developing a handheld fluorescent sensor that is 100 times more sensitive than today’s systems. The first product is for testing water quality by detecting bacteria at a level of parts per trillion. Dorh is also looking at using the sensor to detect the bacteria that cause sepsis in hospital. This currently takes from 10 to 24 hours, so he is working with the department of medicine in an InnovateUK project to develop a chemical tag for the bacteria so that a handheld sensor that can provide a result instantly. Meanwhile Xiao Ai has been working on ways to use single photon measurement technology to detect gas leaks from pipelines. Quantum Light Metrology is using quantum sensor technology licensed by the University of Bristol to Swiss company IDQ to build a lightweight sensor that can be installed on a drone. The software allows the sensor to detect the gas leaks from a distance of 50m from a drone moving at 30mph, and QLM is working with drone operator Sky-Futures to monitor pipelines and gas installations around the world. The most advanced technology in the programme is aiming to provide quantum cryptography for communications systems. KETS Quantum Security has developed a commercial chip that can make unbreakable cryptography systems that are ten times smaller, faster and cheaper than today’s systems, says Philip Sibson, chief technology officer. The technology has been demonstrated in the lab and the company, now with five people, is working with a European defence company on using the system on a drone. Bristol-based IoT equipment developer Telemisis has merged with its manufacturing supplier, Tioga in Derby. The new Tioga Group employs over 150 people across the UK and includes Telemisis, Tioga, Internet-of-Things startup Sixis, surveillance equipment developer Audiotel International and a minority interest in SurePulse Medical, a joint venture with the University of Nottingham. All the companies in the new group will continue to trade under their own names. Telemisis is one of the UK’s leading providers of advanced remote monitoring, control and Internet of Things systems and has recently spun out Sixis. “As an established exporter, we know that Brexit will create new and exciting opportunities for international trade. At Tioga Group we are investing now in expanding our world-class manufacturing and product capabilities, to fully exploit these opportunities,” said Professor Warwick Adams, group managing director. As part of the merger, the co-founders of Telemisis, Tony Richardson and Chris Begent (above) will join the board of the new group. Tioga was founded in 1996 and is one of the UK’s leading privately owned Contract Electronic Manufacturers (CEM), providing electronic assembly and complete product manufacturing. The University of Bristol is leading a £3m project to build the world’s largest ARM-based supercomputer. Isambard is being developed by researchers at Bristol, Bath, Cardiff and Exeter along with the Met Office and super computer maker Cray, which has its European headquarters and research centre in Bristol. This will be one of the world’s first systems to be based on the Vulcan server-class chip being developed by Broadcom, which also has a software development centre in Bristol. Details of this device are still under wraps, but it promises much more memory bandwidth rather than higher peak performance, making it very attractive for researchers around the country tackling big problems. Researchers from the University of Exeter have pioneered an innovative new way to use graphene to make flexible screens more effective and efficient. By using GraphExeter – a material adapted from graphene to be more transparent, lightweight and flexible for conducting electricity through an extra layer of ferric chloride – the team have increased the brightness of flexible lights by up to almost 50 per cent. The research has also shown that using GraphExeter makes the lights 30 per cent more efficient than existing examples of flexible lighting, which are based on state-of-the-art commercial polymers. The research team believe the technology could help significantly improve the viability of the next generation of flexible screens for smartphones or wearable electronic devices such as clothing containing computers or MP3 players. “This exciting development shows there is a bright future for the use of GraphExeter in transforming flexible lighting on a mass scale, and could help revolutionise the electronics industry,” said one of the lead researchers, University of Exeter physicist Dr Saverio Russo. Currently, flexible screens are still in their infancy and although they are useable, the size of the screens are limited by the materials used for mass production, which can cause a visible gradient of brightness as the size of screen increases. By substituting graphene for GraphExeter, the team of researchers were able to create a lit screen that showed a far greater and consistent light than has previously been possible. Furthermore, the screens were more resilient to continued flexing, meaning that they have a longer shelf-life before needing to be replaced. At just one atom thick, graphene is the thinnest substance capable of conducting electricity. It is very flexible and is one of the strongest known materials. The race has been on for scientists and engineers to adapt graphene for flexible electronics. This has been a challenge because of its sheet resistance, graphene dissipates large amounts of energy. In 2012 the teams of Dr Craciun and Profesor Russo, from the University of Exeter’s Centre for Graphene Science, discovered that sandwiched molecules of ferric chloride between two graphene layers make a whole new system that is more than a thousand times a better conductor of electricity than graphene and by far the best known transparent material able to conduct electricity. The same team have now discovered that GraphExeter is also more stable than many transparent conductors commonly used by, for example, the display industry. The report by Chinese tech company Huawei compares and evaluates the 10 leading smart cities in the UK with the aim of celebrating best practice and identifying challenges which need to be overcome for cities to become smarter. Bristol and London have set themselves apart from the others through their clarity, breadth and inclusiveness of their smart city visions and planning, and are leading the way in implementing significant projects at both the pilot and full-scale levels. The other eight cities have been identified as Contenders, Challengers and Followers. Researchers from the University of Southampton and the Institut d’Optique in Bordeaux, France have devised a new approach for controlling light in a silicon chip that could make them programmable. The function of a photonic chip is usually hard-wired, but having reconfigurable optical elements would allow light to be routed flexibly, opening up new applications in programmable photonic circuits. Traditional spatial light modulators use liquid crystals or micromirrors to provide many independently controllable pixels, and this has revolutionised optics in recent years, with many applications in imaging and holography and adaptive optics. In their new work, presented in the April issue of the journal Optica, the team makes use of multimode interference (MMI) devices which are usually fixed. However, the team shows that different modes travelling through the MMI can be dynamically controlled using a femtosecond laser. This acts to effectively shape the transmitted light, allowing some modes through and restricting others. Using a silicon-on-insulator 1 x 2 multimode interference splitter with a projected pattern of perturbations induced by the femtosecond laser, the perturbation pattern achieves routing of light to a single output port with 97 per cent efficiency, essentially making the device programmable. “We have demonstrated a very general approach to beam shaping on a chip that provides a wide range of useful functionalities to integrated circuits. 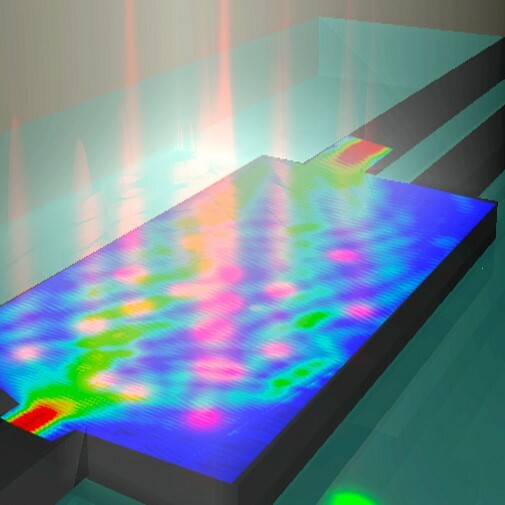 The integrated spatial light modulator turns conventional silicon photonics components into versatile reconfigurable element,” said lead author Roman Bruck, a postdoctoral researcher at the University of Southampton. Bath-based ContinuumBridge has launched an intelligent, connected IoT device called Spur. This is aimed at service providers in the facilities management, retail, leisure and hospitality industries to provide an intelligent, easy-to-use means for service users to initiate a request or report an issue and provides the user with an immediate acknowledgement. The physical part of Spur is a call button that integrates a display whose message indicates to the user what they are able to request/report and then provides instant visual feedback confirming the outcome. For example, if installed by a coffee machine the display could say, “Push here if this machine requires more coffee” and then after pressing the button the display could change to say, “More coffee for this machine has been requested”. Similar scenarios can be applied in other situations, such as reporting that a printer or photocopier is out of toner, or that a toilet needs cleaning. Multiple call options are possible by cycling the e-ink display, for example, requesting waiter service or asking for the bill in a restaurant, and perhaps subsequently rating the customer experience. The technology uses 868MHz wireless for low power connections, allowing a battery life of up to 5 years. A gateway bridge, which only requires a power outlet, provides connectivity between the wireless buttons and a server using a cellular modem so there is no need for network connection. Service providers access the server through a fully programmable but easy to use web portal using the Wisp technology developed by ContinuumBridge. This provides comprehensive reporting that is available through the web site or via email, SMS or data-sharing with a third party database. The whole Spur solution is safe-guarded with state-of-the-art, end-to-end security. “We were trying various wireless technologies such as Z wave, Zigbee and WiFi for the battery life and the range of the radio,” said Claydon. “A mesh is OK if you have lots of them but try telling an installer that. So we worked backwards from those requirements. The e-ink display is great for low power, so we’ve uses a standard 868MHz radio with our own lightweight protocol so that you only turn the radio on when someone presses the button and once an hour to check for updates. At 10 pushes a day that gives us a 5 year battery life and 300m line of sight connection or three floors of an office building from the 868MHz radio,” he said. “The gateway is the same bridge that we have already developed which is a Raspberry Pi at heart with the 868MHz radio and a 3G cellular modem so you don’t have to get into someone’s IT infrastructure and the bandwidth required is so low,” he added. Spur is undergoing trials now in the UK and volume production will commence in mid-2016. ContinuumBridge is looking for distribution partners throughout Europe with North American and other geographies anticipated in the future. Leading cloud computing technology developers are coming to Bristol this week for the UK’s first Voxxed Day conference. The conference cover the latest trends and technologies in cloud computing and development, from Infrastructure and Platforms (e.g. IaaS & PaaS) , Big Data and Analytics, Java and JVM languages, Continuous Delivery and Deployment, Microservices and Containers, Functional Programming, Internet of Things, DevOps, Performance & Optimisation, Architecture & Security and Development Methodologies. The region has a well established base of companies making world-class cloud technology with a global reach – including industry leaders like Oracle, HP, IBM, Cray and Amazon as well as fast growing startups such as ClusterHQ, JustOneDB and ForgeRock. Many of these companies have started to work together as part of the HBB Cloud Special Interest Group (SIG) to help develop the region as a globally established centre of excellence for cloud computing. “High Tech Bristol & Bath CIC was set up to support the cluster around the city regions and high profile events like this are excellent vehicles for doing that. They afford fantastic opportunities for knowledge sharing and developer engagement, together with providing a real boost to our international profile as a great place to be an engineer in the high tech industries,” said Dr John Bradford, High Tech Bristol & Bath. Bristol startup Zeetta Networks has raised £1.25m to commercialise its software-defined networking technology to smart enterprises and Internet of Things (IoT). The company, a spin-out from the University of Bristol’s High Performance Networks group, is an internationally renowned team for their expertise in software-defined networking and network virtualization, focusing on the design, development and marketing of open networking solutions. Zeetta has developed a unique open networking platform called netOS based on industry-standard hardware and powerful orchestration software which manages, automates and monitors the whole network while significantly reduces its costs. This offers a “USB-like”, plug-n-play management of different types of connected network devices and enables the construction of virtual “network slices”, for example separate logically-isolated sub-networks for the deployment of business-to-business or business-to-consumer services, such as Ultra HD wireless video distribution, city-wide Wi-Fi, IoT and other applications. This is being used for the Bristol is Open network across the city. The funding, which is being provided by existing investor IP Group and new investor, Breed Reply, means that Zeetta can significantly accelerate its growth plans. This will enable the company to expand its commercial and technical teams and target new markets. “Since the formation of our company last May we have achieved many impressive milestones including considerable revenues from our first customers and grant funding from the European Commission through our participation in the REPLICATE lighthouse project. The investment from IP Group and Breed Reply cements the confidence of the market in our technology and our team,” said Vassilis Seferidis, CEO of Zeetta Networks. Breed Reply, Reply’s advanced incubator, funds and supports the development of start-ups on the Internet of Things (IoT) in Europe and the USA. Based in London, with operational offices in Italy and Germany, Breed Reply supports entrepreneurs and young talent by quickly bringing new ideas to the market. This is done via funding at seed and early stage level; considerable support with significant know how transfer of business, managerial and technological expertise; and medium-term involvement to establish start-ups in their market. In the IoT sector, the main areas Breed Reply focuses on are fitness and wellness, healthcare, smart home, manufacturing, transportation and energy. Bristol is building on its strength in driverless car technology, hosting a £5.5m project to test out communications systems for driverless cars, while Bristol companies are involved in projects around the country. The three year FLOURISH project links several members of the current VENTURER driverless car project with Airbus, Age UK and artificial intelligence experts React AI to develop innovative new tools to improve the understanding of user needs and expectations of connected and autonomous vehicles. It will be based in the Bristol City Region and will test capabilities in both urban and suburban networked environments. Importantly, FLOURISH will address vulnerabilities in the technology operating connected vehicles, with a focus on the critical areas of cyber security and wireless communications. The consortium will seek to develop tools that enable vehicle manufacturers and transport authorities to provide a safe and secure ‘V2X’ communications network that combine vehicle to vehicle (V2V) and vehicle to infrastructure (V2I) technologies. The project will bring together industry and academic experts in the fields of wireless connectivity, cyber security, data innovation, human factors and social research. Fusion Processing, based at the EngineShed in Bristol, is part of the £2.2m Insight project to develop driverless shuttles with advanced sensors and control systems and trial them in city pedestrian areas, with a particular focus on improving urban accessibility for disabled and visually-impaired people. Researchers from the universities of Bristol and Keio with industrial partners have unlocked 80 THz of fibre-optic bandwidth that will enable future exascale data centres and transform 5G networks. 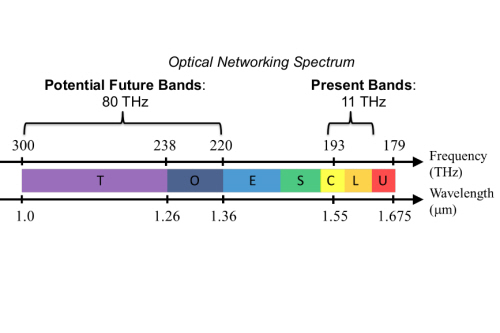 The collaboration between the University of Bristol’s Department of Electrical and Electronic Engineering, Keio University and numerous Japanese industrial partners, have designed, developed and prototyped a pioneering all-optical router that can unlock 80 THz of bandwidth across a newly defined frequency band named T-Band (thousand band) and O-Band (original band). The adjacent bands span from 1.0 μm (300 THz) to 1.36 μm (220 THz) and are able to support 1600 channels at 50 GHz spacing. The technology fabricated and tested is based on cascaded arrayed waveguide gratings (AWGs) and is designed to potentially construct a 1600 x 1600 wavelength router that can guide data at the speed of light. Specially designed quantum dot chips are used for light sources which were originally developed by NICT in Japan. This single passive optical system can interconnect over one million end points such as, broadband home users, IoT devices, data centre servers, while offering at least ten Gb/s per end point. Critically it is also future proof since it’s transparent to any communication signal and it can also potentially consume zero power due to its passive nature. Hiroyuki Tsuda, Professor of Faculty of Science and Technology at Keio University, added: “The enabling technologies for the new frequency band are the quantum dot based optical devices and the silica planar lightwave circuits designed for the new band.